Product #60615 | SKU 5-324 | 0.0 (no ratings yet) Thanks for your rating! 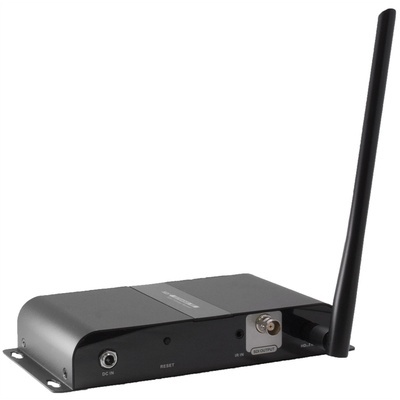 The Cinegears Wireless Prime Full HD SDI Receiver (Encrypted) wirelessly accepts an SDI signal from up to 656'/200m away, and features pairing encryption that will protect the signal. The receiver has an output for connecting the signal to any SDI display, supporting up to Full HD 1080p60 signals, 3D signals, and 7.1 channel surround sound, all with low latency. An infrared passthrough function enables you to remotely control your playback. Compatible with: Blu-Ray, Blu-Ray 3D, PC, Mac, Apple TV, PS4, Xbox One, WiiU, Nintendo Switch, etc. Home and office use, video conferencing, security cameras, digital signage, etc.